Most people buy life insurance to help family members stay financially secure after the policyholder's death. Yet, when a marriage ends, the topic of life insurance after divorce is too often overlooked. Read the divorce agreement carefully. "Life insurance policies are often used to secure alimony and child support payments," says Steven Weisbart, Ph.D., senior vice president and chief economist at the Insurance Information Institute . Before you sign any documents, make sure they meet your needs and that you'll be able to comply with them. 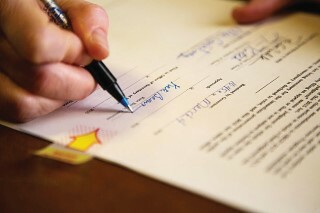 Divorce agreements are legally binding and can be difficult to alter. Discuss duration of coverage. The time frame for any obligatory life insurance coverage varies, often depending on the length of alimony and the ages of the children. If you're purchasing insurance to protect a child financially, look into affordable term life or decreasing term life plans with coverage that expires when the child support obligation ends. Decide who will pay the premiums. Having your ex-spouse pay the insurance company may be convenient, but if you're concerned about the possibility of default, ask your ex to pay you and then pay the premium yourself. Or, have your ex add you to the policy record so that you may receive duplicate copies of billing and lapse notices. "The consequences of your ex not paying you are less than if he or she doesn't pay the insurance company," Weisbart says. "Failing to pay the insurance company could cost you the policy." Re-designate beneficiaries. Depending on the divorce settlement, many couples will rename their beneficiaries from each other to their children. In some states, probate laws automatically disqualify a former spouse from receiving life insurance proceeds unless the insured re-designates their ex-spouse after the divorce. If the children are minors, consider appointing an adult custodian to receive and handle the benefits on their behalf. Be sure to specify when the money will be transferred to the children and the percentage each child is to receive, Weisbart says. And keep in mind that beneficiaries cannot be re-designated after the insured's death, so it's critical to keep the policy up to date. Determine how much coverage you'll need. Examine what your ex-spouse's financial situation would be like if alimony and/or child support payments ended. Talk with your licensed Life Insurance agent and divorce attorney to review your specific situation and how Life Insurance relates to your specific needs.